The North Country Trail is notorious for its meandering course. It takes 4600 miles to get from upstate New York to central South Dakota compared to 1395 miles 'as the crow flies'. Along the way it comes as close to Kentucky as it does to Canada. How does the North Country Trail manage to make its way to Kentucky? 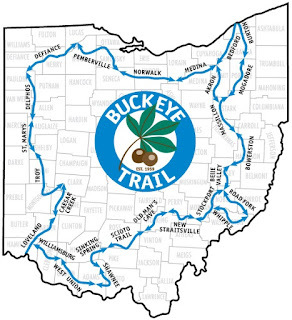 Blame Ohio's Buckeye Trail. Leaving New York the North Country Trail makes a diagonal through western Pennsylvania then joins Ohio's state trail. There, the people who were designing the North Country Trail in the 1980's decided to defer to the older, already established Buckeye Trail's route rather than develop a route of their own. The Buckeye Trail circles Ohio, a big jagged 'O'. But the part of the trail across Northern Ohio is almost all on roads. 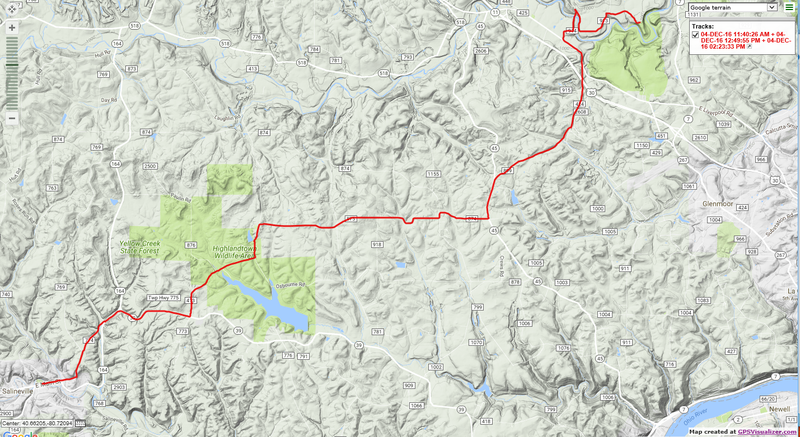 The wilder parts of Ohio are in the south and east, so that's the way the North Country Trail designers decided to go. I wonder whether they were secretly thinking "Hey, let's make this the longest National Scenic Trail in the country". Maybe the Buckeye Trail supporters were lobbying to have most of their trail part of this nationally designated system, because it helps bring funding and awareness. In any case, in order for the North Country Trail to connect to the Buckeye Trail from western PA, it has to traverse a chunk of eastern Ohio on its own, and as I mentioned in my last report, this section of trail feels sort of like an orphan or a foster child, relatively neglected, even unwanted, by comparison with the state's 1444-mile signature trail. Most of this connecting trail is on roads. In my last report I discussed two short sections that are dedicated foot-travel only trail. One is on private land and offers a good wild woods walk, and the other is on an abandoned rail bed beside a designated Wild and Scenic River. The latter is just a mile of trail, the former no more than four miles. There are two more sections of trail in this 'connecting zone' that are closed to vehicles. One is a six mile section of wonderful trail through Beaver Creek State Park. More on that in a bit. From there a road walk of about ten miles takes the hiker to the other off-road piece, a rail trail that starts in the town of Lisbon. 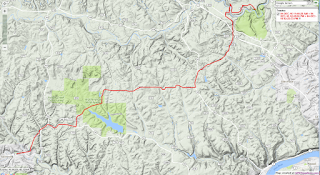 The North Country Trail follows that paved rail trail for just 2.7 miles and then there are more than fifty continuous road-walking miles to negotiate before the orphan-stretch ends and the hiker reaches the first off-road section of the Buckeye Trail proper. I went to Lisbon and looked at the trailhead at the starting point of that 2.7 miles of rail trail. I found absolutely no signage or blue blazes identifying it as part of the North Country Trail. Paved rail trail is nice, but it rarely provides the fix of 'wild' that a foot-only trail can. I'd be done with that 2.7 miles in less than an hour, and then I would face the better part of three days hiking on roads. 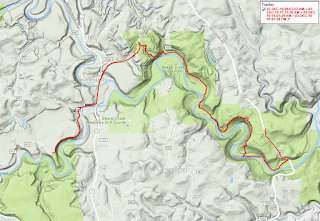 Looking at my own maps I could see that there was a much shorter route by road between Beaver Creek State Park and Leesville Lake, the first piece of off-road trail on the Buckeye Trail, if only I would skip the 2.7 mile rail trail piece in Lisbon. It would save me twenty miles of road walking. I'd follow Ohio 39 through the towns of Salineville and Mechanicsville and on through Carrollton. What the heck. I decided to do it my way. Carrollton here I come. Okay, first came the nice six miles along Beaver Creek in the state park. It was pretty rugged trail, with a couple climbs and descents from river valley to ridge and back. It was all in the deep woods. And I was surprised to find three old canal locks along the trail, remnants of an early 1800's spur canal connecting the Ohio River with the Ohio and Erie Canal. I was out of the woods all too soon, and hitting the road to Carrollton. I crossed Beaver Creek on a quaint old bridge on Y Camp Road before joining Highway 39. Then there was another pleasant surprise where 'old Highway 39' comes into Salineville. There is half a mile of good old fashioned real brick street. And it was in great shape. These were specially designed road bricks, like cobbles, with beveled edges, not the flimsy easily broken bricks used to build houses. When I got to Carrollton I took a break to go visit another trail for a day, not part of my continuous footpath. The Holmes County Rail Trail may be unique in all the world. It's an Amish highway, open to horses and buggies but not to any form of motorized traffic. Look for all the particulars in my next report. 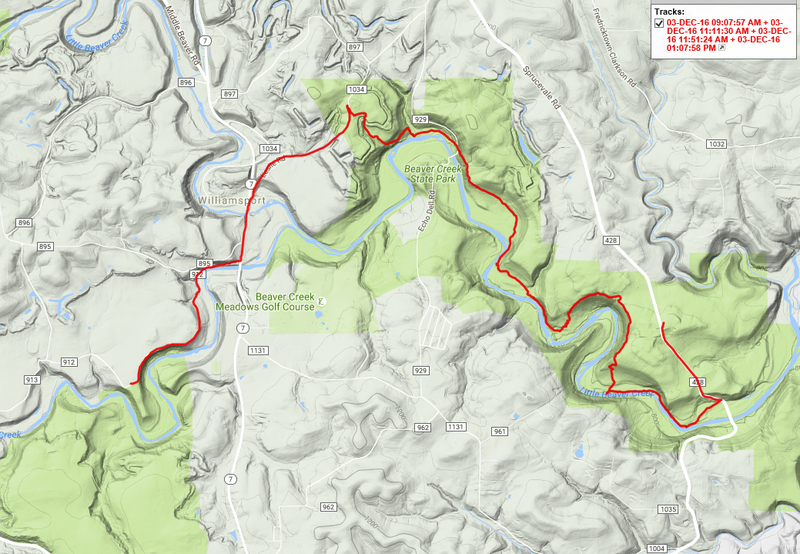 Here are the GPS track maps of the three day hikes it took to get me through Beaver Creek State Park and on to Carrollton.